In this book, a picture is indeed worth a thousand words. Within its covers are 50 literary classics, deconstructed and then put back together word by word to create singularly beautiful pieces of art. The silhouettes that emerge from the text illustrate the central characters, landscapes and themes of each story. This collection ranges across the canon, from 620 BCE to 1937. Bibliophiles will find many of their favourite reads as well as lesser-known gems to discover or rediscover. 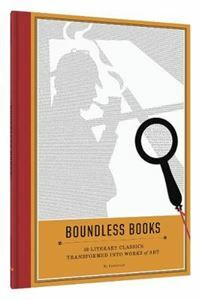 Each piece of art contains an entire text in legible type, so that, with the help of the magnifying glass on a ribbon marker, readers can enjoy both the striking images and the timeless words themselves.